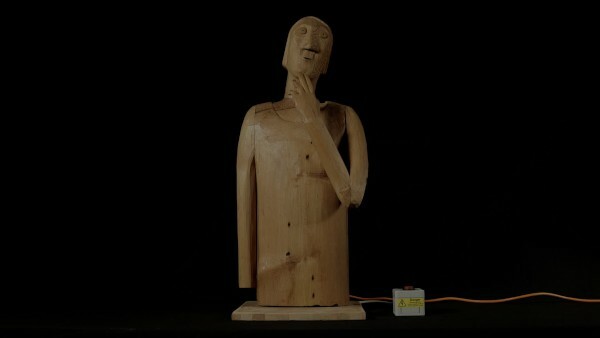 Wooden sculpture of a torso and head, with moving arms and electrical cables at the back of the figure. Head carved from roof beams of an old church in Lowestoft. Body carved from demolition timber with a chainsaw. Disgust, Tim Hunkin, 1982, Crafts Council Collection: W93. Photo: Todd-White Art Photography. Disgust, Tim Hunkin, 1982, Crafts Council Collection: W93. Film by Video in Common. It was part of a series of experiments changing the expression on a face, without breaking it into segments like a puppet. It was also an experiment in using mechanisms to do more subtle things than most of my work, but I found the atmosphere of the art galleries where it was displayed somehow deadening artificial, so since finishing my art gallery spectators, I’ve tried to work on things that can go out into the real world – the more unexpected the place, the better.